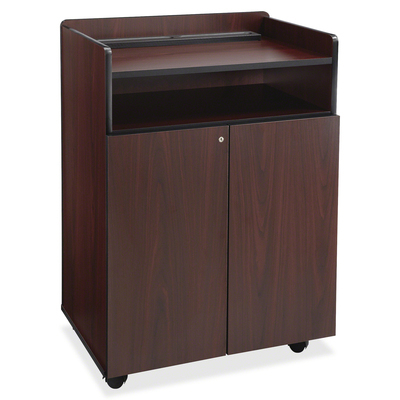 Multifunctional, Mobile Presentation Stand Doubles As A Beverage Cart. The Large, 28" Wide X 18-5/8" Deep, Presentation Surface Features A Pencil Tray And A 2-5/8" High Containment Lip. Open Compartment Below Offers An Easy-To-Access Area For Presentation Or Personal Items. The Locking Cabinet Features Double Doors With A Height-Adjustable Interior Shelf To Store Presentation Materials Or Foodservice Items. Executive Presentation Stand Is Mobile On Four Swivel Casters (Two Locking) And Made Of Quality, 3/4" Thick, Furniture-Grade Wood Construction. Assembly Is Easy With Cam-Lock Fasteners..
Multifunctional, Mobile Presentation Stand Doubles As A Beverage Cart. The Large, 28" Wide X 18-5/8" Deep, Presentation Surface Features A Pencil Tray And A 2-5/8" High Containment Lip. Open Compartment Below Offers An Easy-To-Access Area For Presentation Or Personal Items. The Locking Cabinet Features Double Doors With A Height-Adjustable Interior Shelf To Store Presentation Materials Or Foodservice Items. Executive Presentation Stand Is Mobile On Four Swivel Casters (Two Locking) And Made Of Quality, 3/4" Thick, Furniture-Grade Wood Construction. Assembly Is Easy With Cam-Lock Fasteners.